On 22nd April, Splendid Cinema is putting the ‘art’ back into ‘art-cinema’! Splendid Cinema, in cooperation with Polish filmmaker Lech Majewski, ahead of any UK distribution, is very excited to be presenting The Mill & the Cross (2011). 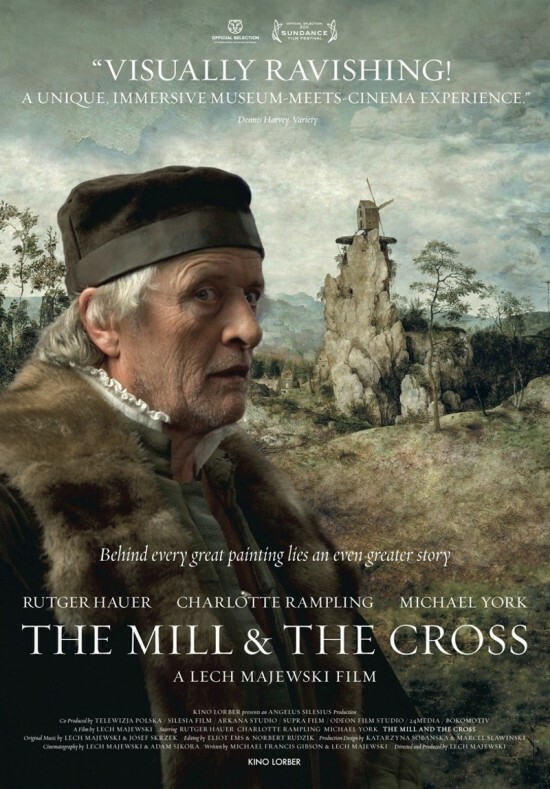 The Mill & the Cross is not a straightforward narrative film; although at one level, the film depicts 16th Century Flemish artist Pieter Bruegel the Elder (played magnificently by Rutger Hauer), painting his 1564 masterpiece “The Procession to Calvary”. 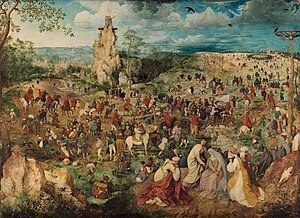 What makes “Procession to Calvary” such a remarkable piece of 16th century Flemish art is how Bruegel populates his crowded scene with images taken from contemporary life. While central to the painting is obviously Christ carrying his cross, the images in the painting are from 16th century Belgium, not 33 AD Judea. snippets of early modern Flemish folk-life as the artist himself would have seen it. Majewski then demonstrates, through Hauer’s performance, how each little piece of observed country-living fit into the larger painting Bruegel envisioned. Much like putting together a complicated jigsaw puzzle, The Mill & the Cross doesn’t tell a story as much as presents insight into how such a remarkable piece of art was constructed. Majewski has created a fascinating ‘art-film’ about the artistic process. In addition to Hauer, The Mill & the Cross also features Michael York as Bruegel’s patron Nicholaes Jongelinck and Charlotte Rampling as a peasant woman Bruegel uses as his model for the Virgin Mary. This is a very different kind of film most of us will have expearienced, but a remarkable cinematic achievement nonetheless. All films are screened at the Worcester Arts workshop (21 Sansome Street, Worcester). Tickets are £5 on the door. Box office opens at 7:00, and the film starts at 7:30. Café Bliss is also open for a pre-show treat. For more information on any our films, please contact Mikel Koven at splendidcinema@live.co.uk, follow our blog (https://splendidcinema.wordpress.com/) or look us on Facebook. The Mill & the Cross (Poland & Sweden, 2011, Lech Majewski) 92 min. TBC.